As we have learned throughout this book, it is the view of Egyptologists that the painted marks within the hidden chambers of the Great Pyramid were Fourth-Dynasty graffiti; crude hieroglyphics painted onto stone blocks by the work gangs cutting the stone at the quarries. Egyptologists do not believe that the quarry marks on the blocks within these chambers were made in-situ, i.e., once the wall and ceiling blocks had been set in place within the chambers. However the evidence presented in this book suggests that this is an erroneous view. In this chapter further evidence will be presented that supports the view that these markings were indeed painted in-situ by nineteenth-century hoaxers and that the Suphis/Khufu cartouche on the gabled roof trussing in Campbell’s Chamber is also a nineteenth-century fake. The conventional opinion of the vertical alignment of the Khufu cartouche on the gabled ceiling block of Campbell’s Chamber is that the cartouche and its associated crew name was painted onto the block while it was lying horizontally at the quarry. When the block eventually arrived at the pyramid it was then rotated and set upright into the ceiling. Thus the horizontally painted cartouche was now effectively rotated 90° and appears vertically aligned on the chamber roof trussing. This seems all very reasonable and perfectly plausible--until we take a much closer look. In 2005, the French photographer Patrick Chapuis presented one of the most stunning, high-resolution photographs ever taken of the Khufu cartouche in Campbell’s Chamber. This remarkable photograph revealed some astonishing features of the painted cartouche, features that had, hitherto, gone completely unnoticed. Using the Chapuis photograph along with some others by Colette Dowall, Ph.D., independent researcher and art expert, John Snape showed that the Khufu cartouche was painted by starting at the bottom-right corner of the cartouche oval. Unsurprisingly, it is in this area of the cartouche that we find the red ochre paint is most concentrated. The cartouche, from this bottom-right point, was drawn upward and round counter-clockwise where the paint gradually becomes thinner as the brush moves around the cartouche to its finishing point at the bottom-left. A close examination of the Khufu cartouche on the roof block reveals something quite peculiar. At the bottom-right section where the paint is at its thickest, traces of at least two runs of paint can be observed running vertically down the vertical block. Furthermore, where the cartouche roof block meets the low support wall, traces of red paint can be observed spreading out horizontally along the joint. Also, just to the bottom-left of the cartouche, as pointed out by independent researcher Philip Femano, Ph.D., the roof block appears to have been scraped in a long horizontal line as though to remove something from the surface. Could this be evidence of a botched paint job where unwanted paint has trickled down from the bottom-right section of the cartouche, where the paint was at its thickest, and spread out along the joint of the low support wall? What these paint runs seem to indicate is that this cartouche, contrary to what Egyptologists state, was actually painted in-situ and not when the block was cut at the quarry. This is to say that this cartouche (and crew name) was painted onto this roof trussing only after the block was set in place. One might not immediately understand the implication of such a finding, but the simple fact is that this finding proves quite categorically that this cartouche must then be a modern fake. We know this because the ancient Egyptian scribes would never have painted this vertical cartouche in-situ in the manner that we observe it, with the signs rotated 90 degrees (sideways) within the vertical cartouche. Were an ancient Egyptian scribe to have painted this cartouche in-situ then the vertical bar would have been placed at the bottom of the cartouche oval and the characters within the vertical cartouche would have been painted standing upright. In short, whoever painted the Khufu cartouche in Campbell’s Chamber painted it onto the ceiling block in such a way as to give the impression that it had not been painted in-situ, but the tell-tale runs of paint contradict this notion. And if it was painted in-situ (as the paint evidence suggests) then it has clearly been faked, since an ancient Egyptian scribe would never have painted an in-situ cartouche oriented in this manner. "A powerfully-argued demolition of the 'facts' on which Egyptologists base their claim that the Great Pyramid was built by the Fourth Dynasty pharaoh Khufu. 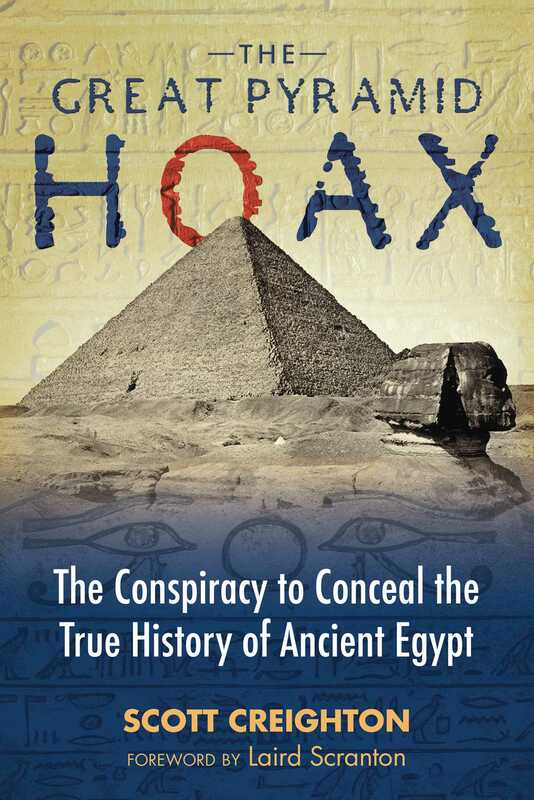 Scott Creighton's excellent new book The Great Pyramid Hoax is a first-class forensic investigation that Egyptologists should really be paying a great deal of attention to, because it pulls the rug of their chronology right out from under their feet."